Lincoln artist Jar Schepers is a self-described surrealistic sculptor with a deeply held socio-political point of view (POV). 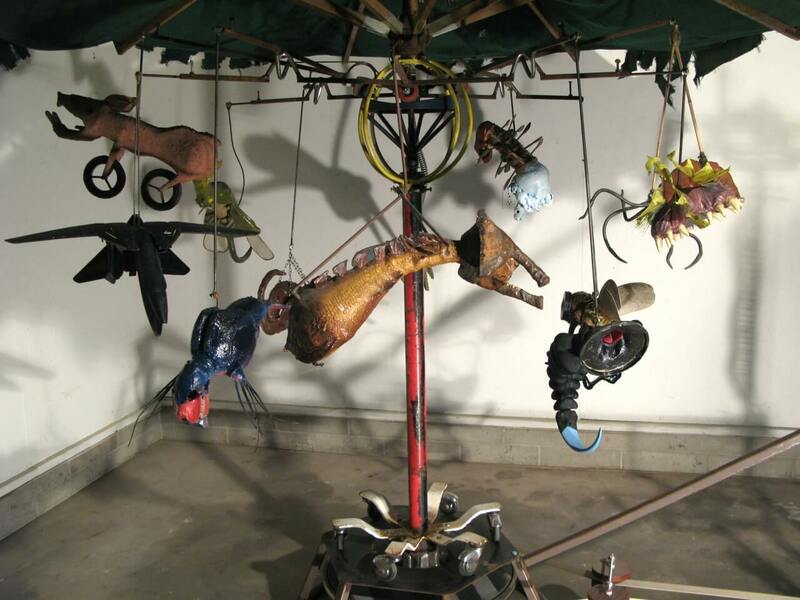 Yet, as Schepers’ current exhibit, Materialization at the Garden of the Zodiac in the Old Market Passageway clearly illustrates, his idealism and social conscience are exceeded only by his wildly creative imagination and artisanship. It’s the latter that most likely will resonate with viewers in this, his inaugural show in Omaha. Materialization, which continues through next Thursday, Nov. 14, features an interactive installation, eight additional large figurative sculptures and 11 smaller wall or pedestal pieces. Whatever their motive or size, all of Schepers’ creation consists of hybridized variations of human, insect and animal material. And all of them macabre. Though close inspection reveals they were made from both salvaged ordinary and unorthodox materials, the artist’s intent isn’t replication. Consistent with the sculptor’s vision, Schepers draws upon a sci-fi-influenced subconscious to create mutations that may remind some of such 50s and 60s films as “Creature from the Black Lagoon,” “Them” and “20,000 Leagues Under the Sea,” or 80s classics including “The Fly,” “Beetlejuice” and “The Thing” with their even more bizarre mutant forms. No matter the inspiration, Schepers’ hybrids create a convincing paradox of hypnotic attraction and admiration and abject repulsion. For many, a fear of six and eight-legged creepy crawlers, reptiles and winged invaders—not to mention humanoid variations—runs deep, especially when bastardized and larger than life. These alien forms from the past, present and future may look vaguely familiar, but their real origin is a subliminal love/hate for the exotic we share with the artist. This push/pull for the weird and extraordinary is at the heart of this show’s surrealistic style. It’s probably what drew its curator, artist Joe Broghammer, to the work as he helped organize this exhibit on behalf of the Moving Gallery. Broghammer’s own avian portraits and earlier carnival scenarios enjoy a mutual connection to this 1920s cultural movement devoted to creating strange creatures from everyday objects “outside of all aesthetic and moral preoccupation,” according to Surrealism’s founder, Andre Breton in his famous 1924 manifesto. A lofty goal to be sure, though the public may best identify with Surrealism via the likes of Dali’s “flaming giraffes” or “melting watches” or the provocative “window paintings” of Magritte. Proof that the movement still has legs can be found closer to home with the art of Schepers and Broghammer along with peers Troy Muller and Nolan Tredway, among others. Whether the above all accept the label, each creates a “superior reality” that at least addresses, if not solves, “principal problems of life.” Broghammer’s “Flock of Joe, with its combination of Audubon detail and twisted ambience and iconography are more personal evocations of the human condition; Muller’s challenging sculptures, scientific “studies” and archeological “digs” are socio-political, satirical cautionary tales; and Tredway’s nearly indescribable narratives and set pieces recreate myth and fiction into expressive, universal psychodrama. If there is a POV that unites Schepers’ work, including Materialization, he has said that it’s “apocalyptic,” invoking again the predominant theme of most “B” and “A-list” sci-fi film, that science and technology used to excess and minus a moral compass will be humankind’s downfall rather than salvation. Yet, this rather skeptical attitude is underscored by the artist’s vision and aesthetic that at the very least points to art’s powers of redemption and restoration. If that is mere hyperbole, then let Schepers’ art speak and amaze for itself. So strong are the work and its presentation that the gallery resembles a museum of preternatural history. Works hang on walls, ceiling or from a merry-go-round. Others sit on pedestals or on the floor. As always in a theatre of the macabre, first impressions are strong and immediate, a mix of awe and curiosity that only increases as one moves from the venue’s front space through the haunted hallway and to the final shock that awaits in the antechamber of horrors. A press release on the gallery wall reiterates Schepers’ intent to comment on such pertinent contemporary issues as genetic engineering and the human impact on natural order. But here in the front room his message is overwhelmed by the work itself as it amazes, and in the case of “Creature Carousel,” entertains. Viewers will enjoy this hand-cranked whirligig whose menagerie of wonderfully grotesque flora and fauna responds with a danse macabre that may distract one from the intricate mechanism of Schepers’ device that makes all this happen. An even larger disconnect between title and work exists with “The Average Consumer” as it occupies its own well-deserved corner and spotlight. This magnificent undersea dweller made of recycled wood and shards, a plastic Christmas tree, oil and acrylic is the single most creative work of grace and splendor in the show. At 10 feet long from the tip of its willowy tail to its saw-toothed maw, this possible hybrid of an Antarctic ice fish, viperfish and fanfin seadevil floats out of the Mariana Trench of Schepers’ imagination into our psyche. But its supposed analogy to an average consumer, ironic or not, is a bit of a stretch. Credit instead Schepers’ aesthetic that this most engaging work soars above the fray because of its convincing form, proportion, balance and alarming visage. Walking through the hallway of haunts is like running a gauntlet, alarmed at every turn of the head at each new amalgam of human, insect and animal parts that catches and holds our attention. We admire their unique blend of head, body and appendages. And their distorted and exaggerated features seem right, so cleverly does the sculptor use his appropriated materials. Even the titles serve their subjects. “Vertabratortoise” is indeed an earth-toned blend of deer bones, turtle shells, shed snakeskin, metal and oil paint, sure to capture one’s gaze as it averts another. “Biomorphic Flea,” a monster of a baby that has metamorphosed into an eight-legged, clawed crustacean sporting a doll’s head is likewise guaranteed to offend even as it fascinates. However, nothing in this rogue’s gallery of environmental mutants quite prepares you for what lies and hangs around the corner. Especially three floor sculptures, most aptly titled “When Will We Cease To Be Human?” This trio of large humanoids in some stage of gestation best serves Schepers’ socio-humanistic commentary. This is some angry stuff guaranteed to scare hell into any self-respecting Creationist who fears any reference to evolution or, in this case, devolution. For further consideration Schepers offers his wall sculpture, “Post-Apocalyptic Nuclear Family,” consisting of mom, dad and two siblings, horrific survivors of an atomic holocaust. This is his most prosaic work, but even these trophies to man’s inhumanity effectively illustrates his apparent doomsday vision. Despite this, Schepers remains the existentialist. Rather than try to answer why mankind destroys, his art is its own reason for being, and for his. Materialization continues through Nov. 14 at the Garden of the Zodiac Gallery, in the Old Market Passageway, 1042 Howard St. For more information contact 402-341-1877 or vmercer3@cox.net.